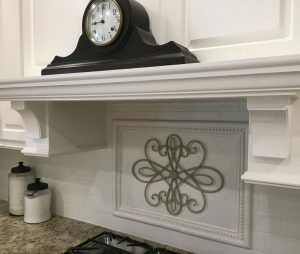 Sally from Tulsa, Oklahoma recently remodeled her own kitchen and were looking for some final additions above the stove area. They chose to go online and purchase a couple Ekena Millwork rubberwood Clarksville brackets for their kitchen. After the brackets were delivered, she painted them to match the other items in the kitchen. Installing it with adhesive glue and some wood nails, the brackets were put into their place. The brackets created a clear border for the stove area of the kitchen and they look great!